CFB Marine Group now has 3 offices to serve you in San Diego... Our newest location is at the newly remolded Kona Kai Resort and Marina at the end of Shelter Island! CFB Marine Group is supporting the summer membership drive at the Vallarta Yacht Club in Nuevo Vallarta on beautiful Banderas Bay. Ask us about special summer rates to join this great club, host of the WesMex Sailing Regatta and the Jr. Olympics for Mexico. Had trouble getting your boat shown and sold in Mexico? CFB Marine Group of San Diego has brokerage representatives in Puerto Vallarta and Nuevo Vallarta, Mexico to service buyers and sellers. Contact us for more information on how we can help at 619-291-9300. CFB Marine Group and Voodoo Sportfishing continue to sponsor local events for 2011... the San Diego Anglers Open Bay Bass Tournament, Port of San Diego Day At The Docks and the San Diego International Yellowtail Derby. We encourage everyone to come out on the water and support the San Diego sport fishing community. CFB Marine Group owner/broker Bruce Biddick (right) awards the grand prize trolling motor we donated to the winner of thr 2010 2nd annual San Diego International Yellowtail Derby. We encourage the fishing community to partipate and sponsor this great event. Contact John Campbell at 619-991-5480 for information on the 2011 Yellowtail Derby. Another exciting new design from Patrick Bray...Introducing the 137' (42m) Ocean Motoryacht...a long-range vessel with not only a helicopter pad but a hanger as well. Spacious accommodations for 10 guests and up to 10 crew members. A super fuel-efficient, semi-displacement hull form to ensure superior powering characteristics and seakeeping. This vessel has in excess of a Transatlantic range at 12 knot cruise as well as being capable of higher semi-displacement speeds for local cruising. Combining the passions of the individual owner with a thoughtful and practical balance of beauty and refinement of design...the ultimate sportsman's yacht. Voodoo Sportfishing and CFB Marine Group are once again sponsors of Day at the Docks at Fisherman's Landing. Come down to the docks on April 19, 2010 from 9am to 5pm and visit San Diego's Sportfishing fleet. Our long range sportfisher Voodoo will be on display at the docks in front of Fisherman's Landing. Come join us for an informative day and find out about our all-inclusive long range six pack charters. Voodoo Sportfishing and CFB Marine Group are proud sponsors of the 15th. Annual San Diego Anglers Open Bay Bass Tournament on Saturday January 30, 2010. Comprised of 150 two-man teams, anglers compete and weigh their 5 fish limit (combination of any 5 Sand, Bay or Calico Bass) after about 6 hours of fishing in beautiful San Diego Bay. The tournament is followed by prizes, raffle, BBQ, sponsor and vendor booths. Visit www.sandiegoanglers.com for entry form and information. Patrick Bray of Bray Yacht Design and Research Ltd. and designer Ken Freivokh collaborate on design for new 137' Ocean Explorer Motoryacht to build to suit for 2011. Noted designer Ken Freivokh of the sailing yacht "Maltese Falcon" joins with the master of super efficient hull design, Patrick Bray to give you the exotic, avant-guard styling of the 137' Ocean Explorer Motoryacht. 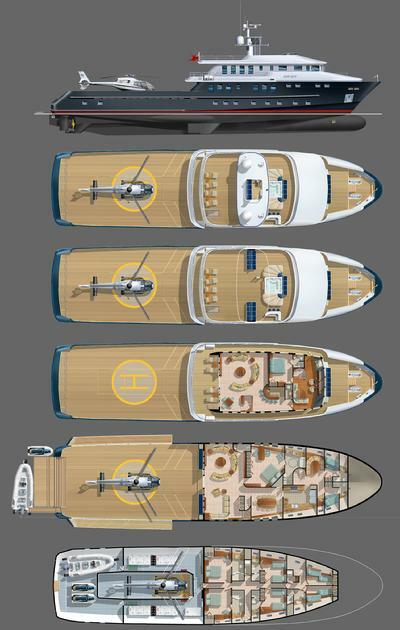 This new design for 2011 can be reviewed and discussed with the designer at the Ft. Lauderdale International Boat Show Oct 29- Nov 2 2009. Bray Yacht Design and Research Ltd. will be showing in the Super Yacht Tent Booth 790 in association with the British Columbia Yacht Building Association. Navel Architect Patrick Bray of Bray Yacht Design and Research Ltd. will attend the November 2009 S.M.A.R.T. Conference in La Spezia, Italy as a guest of the Italian Government. A conference to promote global Shipping, Manufacturing, Alliance and Research Technology will feature Mr. Bray's award winning fuel-efficient and technologically progressive "green" designs.